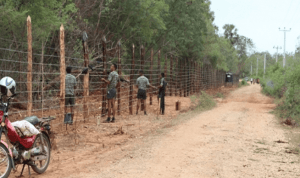 Jaffna News: After the change in the country in 2015, 2,800 acres land has been released from Army's High Security Zone in Valikamam North in the last three years. In this year alone 872 acres of land is released. Six Sudhiran, chairman of the Valikamam North Pradeshiya Sabha, said that six more schools are still in the military high security zone. The event was released yesterday at the Military High School in Mayility College. He said this as he was present at the event and commented on the media. The request was made to release the school of Mayilitti Sirisena to the recent visit to Mayility. He promised to release that school within two weeks. That school was released today. Prior to a 2015 change in the country, there was 6,300 acres of land in the Army High Security Zone in Valikamam North. But over the past three years, after the change of power, 2,800 acres of land has been released. In this year alone 872 acres of land is released. Yet six schools are in the military high security zones without being released. Specifically, the schools like Mayilithi RC, Vayavilan Srivaluppillai Vilasala, Palali Siddhivinayagara, Palali American Missions, Kankesanthurai RC, Kankesanthurai Maha Vidyalayam are not released. Similarly, the headquarters of the Valikamam Northern Division, many children, including children's park and playgrounds, have not yet been released.